Unlike past years, not a whole lot is on the line for this Friday’s Civil War game between Oregon and Oregon State. No Pac-12 championships, no Rose Bowls. The Ducks look to perhaps improve their bowl prospects. The Beavers’ season ends regardless of the outcome. But there are bragging rights. The Ducks (7-4, 4-4 Pac-12) are bowl-eligible but the most they can finish with is eight wins. It is looking increasingly likely that they’ll land either in the Redbox Bowl or the Sun Bowl, but a win in the Civil War might get them a bid from the Holiday or Alamo. Oregon’s future also relies a bit on the results of the Apple Cup. If Washington State wins, then wins the Pac-12 championship and somehow lands a spot in the College Football Playoff, the Cougars would play in the one of the designated semifinal bowls. And the Rose Bowl would choose the representative from the Pac-12. The Beavers (2-9, 1-7) would like more than anything to collect another win in coach Jonathan Smith’s first season. The former Oregon State quarterback was urging a level-headed approach. Friday will be the 122nd meeting between the two teams. Oregon has won nine of the last 10 meetings and holds a 64-47-10 all-time advantage. A few highlights — and lowlights — from past Civil Wars. LAST YEAR: Oregon State capped a turbulent year with a 69-10 loss to the Ducks at Autzen Stadium. Beavers coach Gary Andersen had abruptly left the team in the middle of the team’s one-win season. Royce Freeman ran for 122 yards and two touchdowns and Justin Herbert passed for 251 yards and three scores. It was the final game of a one-year stint as head coach for Willie Taggart, who left for Florida State in early December. EARLY DAYS: Oregon State, then Oregon Agricultural College, won the first one 16-0 in a showdown between the “Farmers” and the “Lemon-Yellows” in front of some 500 fans. In 1916, Oregon beat OAC 27-0, giving the Ducks a 6-0-1 regular-season record and their first appearance in the Rose Bowl, where they topped Penn 14-0. PYRAMID PLAY: The 1933 game was notable because Oregon’s extra-point attempt was blocked by Clyde Devine, who was lifted in the air by his teammates. The Ducks nonetheless defeated Oregon State 13-3, and the so-called Pyramid Play was later banned by the NCAA. TERRY BAKER: In 1962, the Beavers and their Heisman Trophy-winning quarterback trailed 17-6 at halftime but dominated the second half. Terry Baker’s 13-yard touchdown pass to Danny Espalin in the fourth quarter sealed a 20-17 victory. Baker was the only Heisman Trophy winner from an Oregon school until Oregon quarterback Marcus Mariota in 2014. GIANT KILLERS: A week after beating No. 1 USC and O.J. Simpson 3-0 in the mud in Corvallis, the Beavers’ famous 1967 “Giant Killers” team came back from a 10-0 deficit to win the first Civil War at the new Autzen Stadium, 14-10. TOILET BOWL: A futile 0-0 tie on a blustery and wet day in November 1983 featured 11 fumbles, five interceptions and four missed field goals. It would go down as the last scoreless Division I college football game. 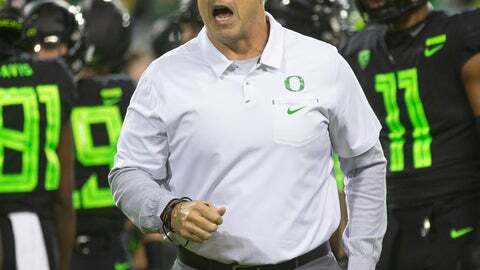 “It was almost like neither team wanted to win,” Oregon coach Rich Brooks was quoted as saying. ROSE BOWL BOUND: The Ducks entered the 1994 Civil War tied with USC for the Pac-10 championship and needed a win to clinch their first Rose Bowl berth since 1957. Trailing 13-10, Danny O’Neill drove the team 70 yards, hitting Dino Philyaw for a 19-yard touchdown with 3:47 to play, giving Oregon a 17-13 victory. THE FLY SWEEP: The Beavers snapped a 10-game winning streak for the home team in the 2007 Civil War when freshman James Rodgers scored on a fly sweep for a 38-31 double-overtime victory. On Oregon’s chance to answer, the Beavers stopped Jonathan Stewart on fourth-and-1 from the 16.